Meet "Eloy." He's the reliable and creative graphic design genius based in Tucson, Arizona who serves both local and national clients. One of his national clients is a company headquartered in New York City. Eloy left his office one beautiful Friday late afternoon to visit his printer to discuss an upcoming meeting with a new, prospective client. After the meeting was over, Eloy checked his phone and noticed he received an urgent message from his NY client. Turns out the batch of business cards they ordered and received for an important meeting that Saturday was for a different “David.” With two “Davids” in their office, they sent Eloy the wrong name. Oops! The term "rush job" instantly received an entirely new meaning. Luckily, the printer already had Eloy’s art files. But, the digital press was shut down for the day and pressman (like the rest of the production team) had gone home to start their weekend. There were only two employees left “in the back” of the shop--the production manager and the delivery driver. While the press was powered up again, the prepress department rushed to make the text changes. Eloy checked the proof and approved it on the spot. File sent to the press, done! Carefully printed, accurately trimmed, and protectively boxed... check, check, and, check! Not done yet. The production manager had to remember how to use the overnight shipper’s program that he had not worked with in over a year. Taking a deep breath, his memory served him well. Whew! Catastrophe avoided; happy clients all around. But, wait... what kind of time frame are we talking about here, anyway? 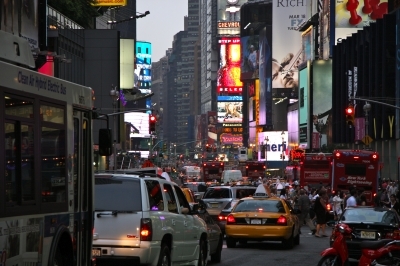 According to the Dictionary of American Regional English, a "New York Minute" means, "Immediately. Equating to a nanosecond, or that infinitesimal blink of time in New York City after the traffic light turns green and before the ol’ boy behind you honks his horn." In other words, this “New York Minute” occurred in less than 30 minutes flat! The printer is checking with Guinness to see if that is a record. Are you in a hurry & worry your project won't be printed or mailed in time? Just ask a Spectrum Customer Service Representative to help you at (520) 571-1114.